OF applescripts can be run from the OF toolbar, from the OF Script menu, or from tools like LaunchBar, Keyboard Maestro, or FastScripts. Since OmniFocus 1.8 it has been possible to use AppleScript applications as toolbar items (in addition to Automator workflows, and scripts stored in text, compiled, and script bundle format). Copy your script into the OmniFocus scripts folder, which should now have opened. When OmniFocus is running, your script can now be run from the OmniFocus scripts section of the Script menu. Past the image onto the icon in the file Info dialogue. The dialog which appears will now enable you to drag your applescript onto the OF toolbar. Close the dialog, and experiment with running your applescript by clicking its icon in the toolbar. if there wasn't an OmniFocus folder I would let go on applications and then (as you indicated) create one. Yes, me too - I didn't choose that route for the FAQ because the Show script menu in menu bar option will sometimes be un-checked in the Applescript Utility. Yes - FAQ amended accordingly. I'm doing something wrong here. 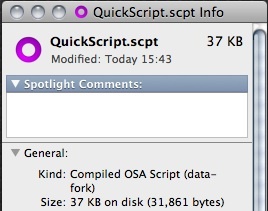 I've got my script in the finder scripts menu (no problem). I open the Customize toolbar window as described, but I can't drag any script onto it. I can't drag anything onto . All I can do is access the icons that are there. What I'm trying to do is put the most excellent "Reveal" Applescript onto the toolbar. You shouldn't need to drag anything to the customize sheet. 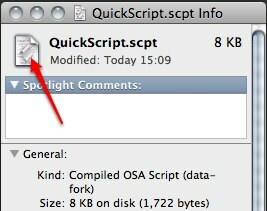 If the applescript has been installed into the correct folder, you should see the icon in the sheet. What you want to do is drag the icon for the script from the sheet and to your OmniFocus toolbar. Is there an explicit name for the folder or something? I've named the folders simply "OmniFocus" and that is how it appears in the finder script menu. Last edited by RobTrew; 2008-04-14 at 01:22 PM..
Work now. Folder is important.